Continue work from yesterday, but to observe the ADA kinetics with an inhibitor. Add 0.1073 g of adenosine to a 10 ml volumetric flask. Fill with 50 mM phosphate buffer at pH 7.4. This created a stock solution of 0.04 M.
Add 10.00 μL of the 0.04 M adenosine stock to a 10 mL volumetric flask. Fill with 50 mM phosphate buffer at pH 7.4. This created a final solution of 40 μM. 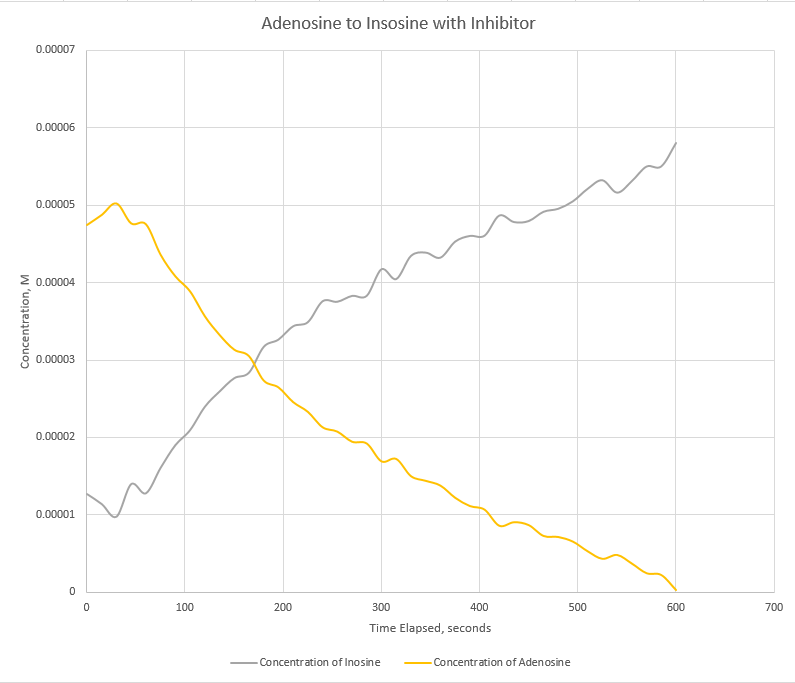 Add 3 mL of 40 μM adenosine solution to the cuvette and 30 μL of inosine. Just before 1 minute, add 1.5 μL of 1 nM EHNA. The reaction samples will contain roughly 1nM EHNA.